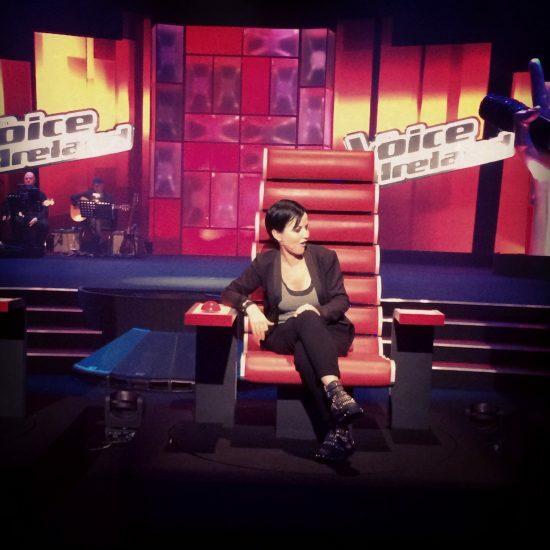 As promised, here’s some news from the Blind Auditions of “The Voice of Ireland” TV show where Dolores just appeared as a coach for the first time this year. Some members of our team were on site and were quite surprised to see how easily Dolores plays the game, almost stealing the show from Kian Egan, one of the 4 original coaches and superstar of the show. She seems to be taking her role very seriously and is probably the most professional coach on the set, giving candidates technical advices, as well as entertaining everyone with numerous jokes. Looks like people in the audience have been enjoying her speeches as much as they often ended up encouraging candidates to choose her as their choach. Dolores revealed during the show that she will sing at Concerto di Natale this winter in Italy. According to the new message posted by Noel Hogan on Tumblr on October 11th, The Cranberries guitaris is working on a new (Mono Band?) EP. Last June Noel revealed demo samples of new songs recorded with Fin Chambers, “Waking Up All Over” and “Start & Scars.” It remains unclear whether these songs will be featured on this upcoming EP or not. As we get closer to the first shootings of “The Voice of Ireland” which will take place on October 18th, 19th and 20th, numerous articles related to Dolores appear on the Irish Press. Her participation to the TV show will expose her to a new audience of young people who do not necessarily now much of The Cranberries career. As a consequence, in the article entitled “Dolores is back in the limelight and bidding to find a new voice“, the Irish Independent decided to introduce the singer in a pretty harsh article which tends to emphasize the fact that The Cranberries’ worldwide success has a bitter-sweet taste for Irish people. Let us recall that the band didn’t play a single concert in their home country on their 32 dates European Roses Tour in 2012. Let’s get prepared to read lots of similar articles in the following months. 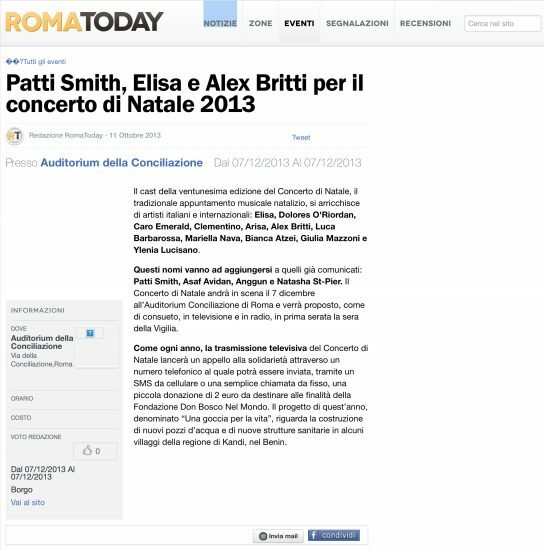 As you might remember, Dolores was due to perform at “Concerto di Natale” in Italy last year but her name was taken off the official website (concertodinatale.it) at the last minute. According to the RomaToday (romatoday.it), Dolores should be part of this year’s edition which will take place at the Auditorium Conciliazione in Roma. As for the official website of Concerto di Natale nothing has changed yet and their homepage’s banner still does not include the name of Dolores. Thanks to Irishsoul for the info. CONFIRMED. As reported 3 days ago (October 20th) in our news about The Voice, Dolores will sing at “Concerto di Natale”. It is now officially confirmed on the Facebook page of the event but not yet on their website! Probably just a question of time as nowadays only Facebook seems to count! As usual the show will be pre-recorded (Saturday, December 7, 2013 at 7:00pm-10:30pm) for a later TV and Radio broadcast in Italy. All those who’d like to go can get tickets on the official website. Finally Dolores O’ Riordan appeared today on the official website… and it was worth the wait! Dolores appeared tonight on the TV show ‘The Late Late Show” broadcast on Irish TV RTÉ One. She revealed that she is now the new judge/coach of the famous TV show “The Voice of Ireland” replacing Sharon Corr who decided not to take part in the singing competition this year. It’s great to be back in Ireland and to be taking part in one of Ireland’s most popular TV shows at same time. I know a good voice when I hear one and I am out to find the best star in the country. She is now back in her home country to record the third series of blind auditions and the shooting should start on October 18th, 19th & 20th. 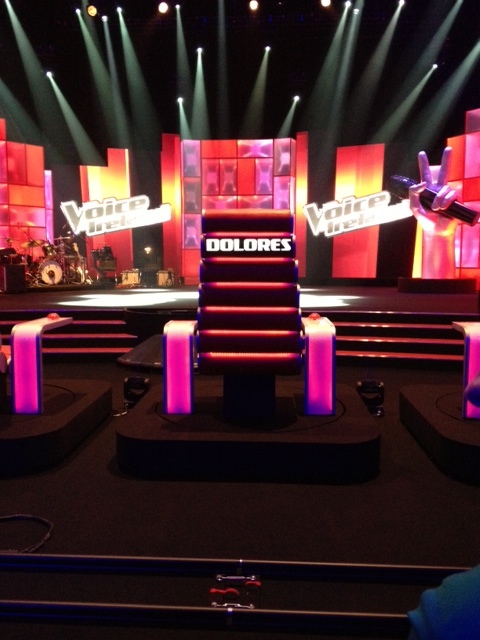 Dolores will have to choose ten contestants to work with and lead the best of them to the final. 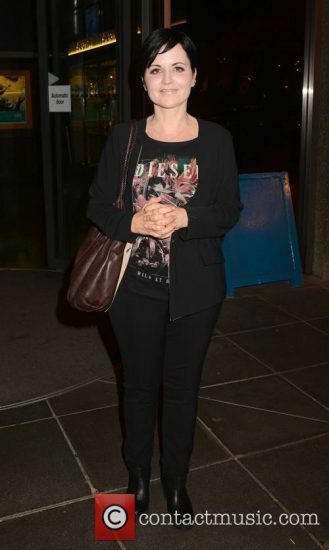 contactmusic.com put online 6 different preshow photos of Dolores arriving at RTÉ studios in Dublin for “The Late Late Show” last Friday, October 4 (and not Saturday 5 as written on their website) as well as other guests appearing on the show that night like Sinead O’ Connor, Laura Whitmore and more. Noel Hogan made available demo samples of the new Mono Band songs recorded with Fin Chambers in May. Demos are called “Waking Up All Over” and “Start & Scars”. Noel Hogan plans to enter recording studio for his Mono Band solo project next month. The Cranberries’ guitarist posted a short message on his Facebook production page yesterday, saying that he is set to record some drums and bass for two tracks he did with vocalist Fin Chambers. One of the two titles was already revealed by Hogan in 2011, “Waking Up All Over”, while it is the first time we hear about “Start & Scars”. Noel has also been doing some production work for other acts for a few weeks. Senakah‘s “Human Relations” (for which Noel worked as a producer) was released last month. 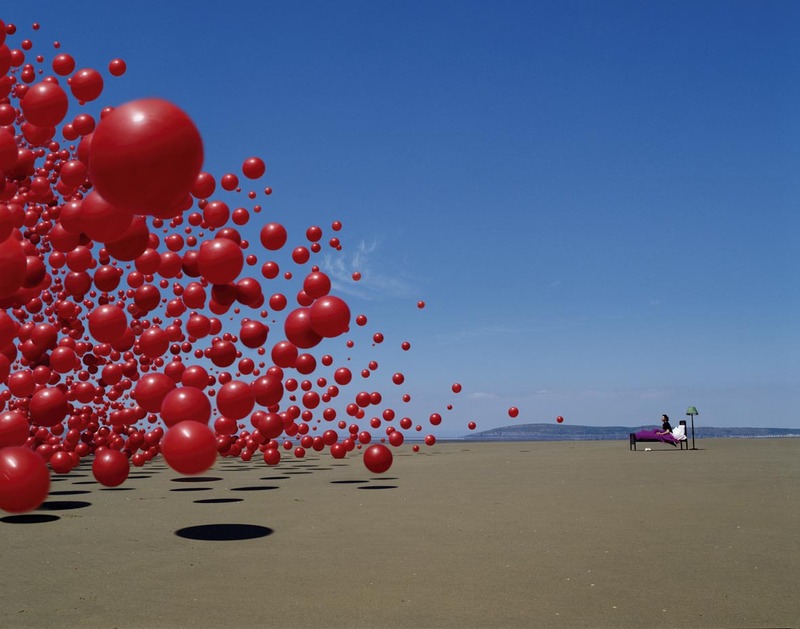 The Cranberries album designer Storm Thorgerson passed away yesterday, April 18th, at age 69. 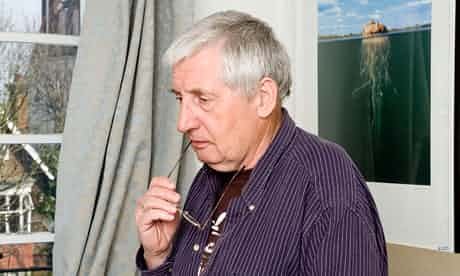 The English graphic designer, mainly influenced by surrealism, is best known for his work on many music album artworks, including Pink Floyd and Led Zeppelin. 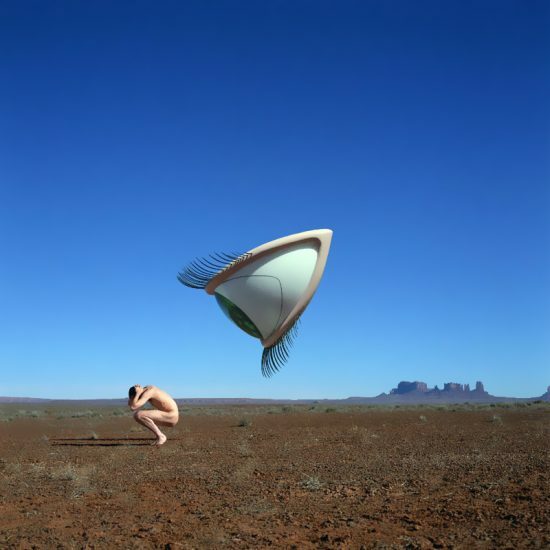 In The Cranberries world, Thorgerson designed “Bury The Hatchet” and “Wake Up And Smell The Coffee”. He also created artworks for these two album’s singles and “Beneath The Skin”. A year before the release of their first album in 10 years, The Cranberries made good profits through their own company, Curtain Call Ltd. According to the Irish Times, the band’s company recorded well-deserved profits of €71,973 in 2011 and €248,183 a year before, mainly with their Reunion Tour, while music sales continues to decline in the entertainment industry for a decade or so. Each of the band’s four members has a 25 per cent stake in Curtain Call. With the release of “Roses” in 2012, followed by short tours in Asia and North America and an extended one in Europe, 2012 must have been a good year for the band, financial-wise. 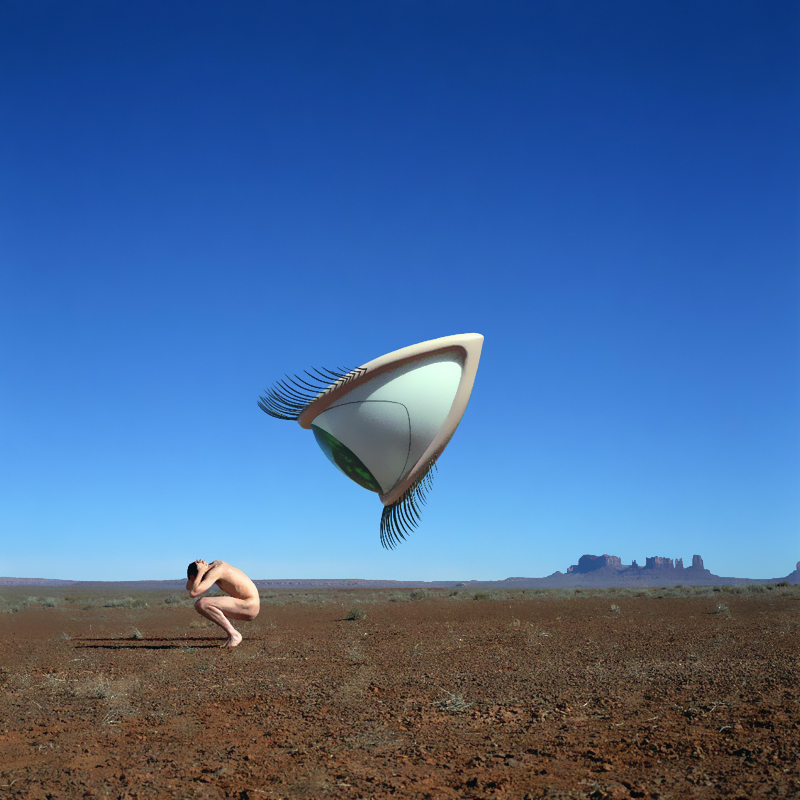 Yesterday a new bootleg of The Cranberries surfaced on the internet. It is almost 11-year old as it was recorded live in concert on June 1, 2002 in Pompano Beach, USA (near Miami) during the “Wake Up And Smell The Coffee World Tour ’02”. We usually don’t write any news when a new bootleg comes out and we simply add it to our bootleg database (which is small for now but is bound to grow over the coming months and years). This new old recording is an exception as it is quite special and deserves a few explanations. Because we usually know 2 ways of recording a concert: Professional made by professional and authorized people and Audience made most of the time by fans in the crowd and unauthorized. Datfly (the uploader -and maybe taper?- of this new bootleg on dimeadozen.org) tells us, in file description, that the recording features very heavy Dolores vocals so there are good chances that the IEM Feed recorded here is Dolores’ one. There we have a professional source recorded by a non-professional and probably non-authorized person. The result is kinda unique and everyone will have its own opinion on the quality and interest of the thing. It’s up to you to listen. Hear the accuracy of Dolores singings like rarely heard before. Anyway what is for sure, The Cranberries Fans Community definitely have a new collector piece! According to a very intriguing promo CD that has surfaced on eBay, The Cranberries’ song “Raining In My Heart” might have a chance to be featured on some TV shows or movies. 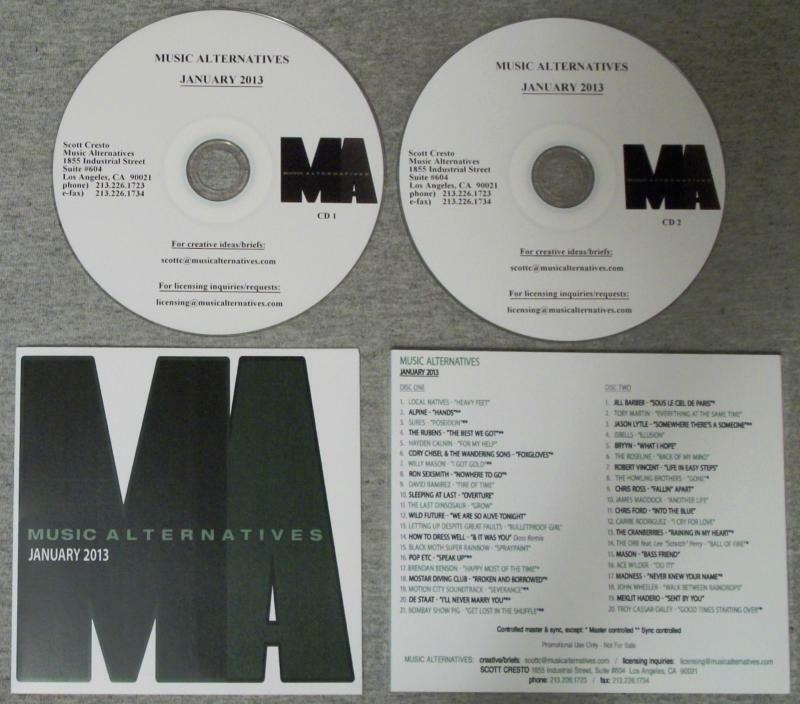 Songs from Music Alternatives’ artists were placed in many popular TV shows such as “Grey’s Anatomy”, “Criminal Minds”, “Supernatural”, “Castle”, “How I Met Your Mother”, “Bones” and many many more…. “Raining In My Heart” was the second promo single from “Roses” in some countries, so who knows, maybe Cooking Vinyl didn’t give up on a promotion of the latest album? Placing new songs in popular TV shows is quite a common practice. For example, The Cranberries’ songs “Analyse” and “Never Grow Old” were placed in “Smallville” and “Alias”. Maybe in few weeks we’ll hear “Raining In My Heart” in some TV show or commercials? Zacatecas Festival seemed to have announced their 2013 line-up prematurely last month: there never was an agreement for a show between The Cranberries and the festival. We can only assume that the rest of the rumors about Dolores are also unfounded. Rumors have been spreading around about Dolores health for a few days now, since Zacatecas Festival canceled The Cranberries gig originally scheduled for March 25th. Our fansite has chosen not to contribute to the rumors and not to put a name on whatever possible reason the gig was cancelled. Remember that the band has not announced anything about this, so we can only presume that these are speculations. We would also like to point out that some statements by the Zacatecas representatives include some inaccurate information about Dolores’ previous health condition. The only known health problem that Dolores suffered from over the last few years was some vocal cord nodules. The current rumor could be a simple misunderstanding. Whether or not Dolores is afflicted by a health problem, we feel that she should be the one announcing it publicly if she wants to, not some concert promoter. We feel that the last days’ statements were inappropriate. The Zacatecas festival announced that The Cranberries will not attend their festival according to DireccionesZac. The band had not confirmed its presence to this festival nor decline it on their official website. Last week, the Zacatecas festival included The Cranberries on their official program. Let’s hope that everything is alright with the band and that their silence is only due to some [well-deserve] time off, even though everyone misses them already. Thanks to Cranberries Mexico for the news. Concert Live’s CD release of The Cranberries London 2012 concert is now available in UK music shops and web vendors. The show was previously available to purchase in CD format exclusively on the Concert Live website since October. It was also released digitally last December. 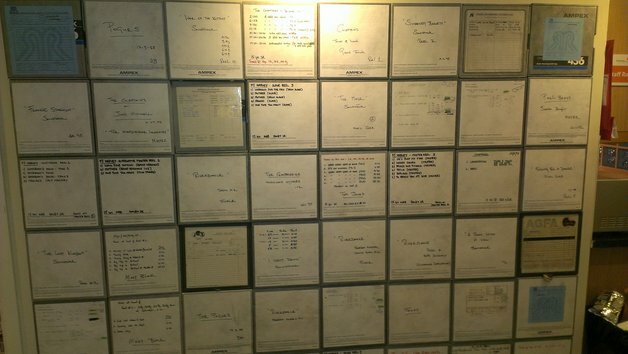 Master tapes recorded at the Windmill Lane Studios might be Universal and Island’s record property, as the record label probably paid for the recording sessions back then. Thanks to the Dave Fanning Archives for the info. 20 years ago: Everybody else was doing it… and so did they! Last Thursday, we learned that the mater tapes of this album, which could include possible outtakes and unreleased tracks, are facing destruction as Windmill Lane Studios appealed to musicians who have worked there to collect them before next May or else they’ll be destroyed. 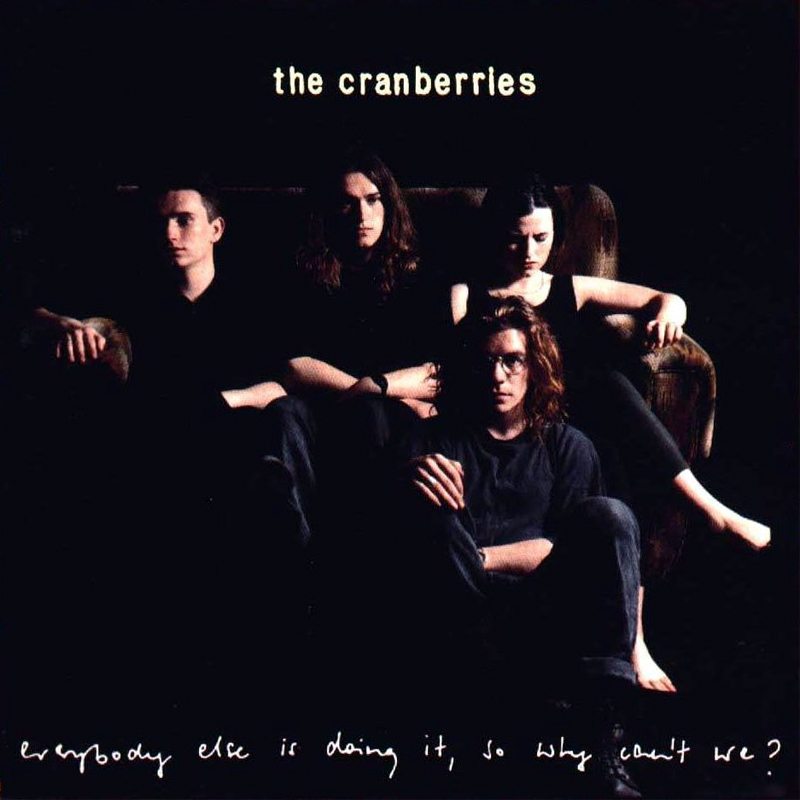 The Cranberries began the recording of their first album in January 1992 with Pearse Gilmore who previously worked with them on their Xeric label material. However, the band was not happy with the results and the work was scrapped. “Unhappy with the results – Gilmore had cluttered the mixes with dance beats and industrial-style guitar – and barely on speaking term with each other, the band scrapped the tracks and fired Gilmore” (Rolling Stone Magazine, March 23, 1995, page 60). After hiring a new manager, the band started working again on the album, this time with producer Stephen Street. Everybody Else… peaked at #18 on the Billboard 200 and stayed on this chart for 130 weeks (more than 2 years!). After a rough start in the UK, the album reached #1 of Album Charts and stayed in chart for 86 weeks. 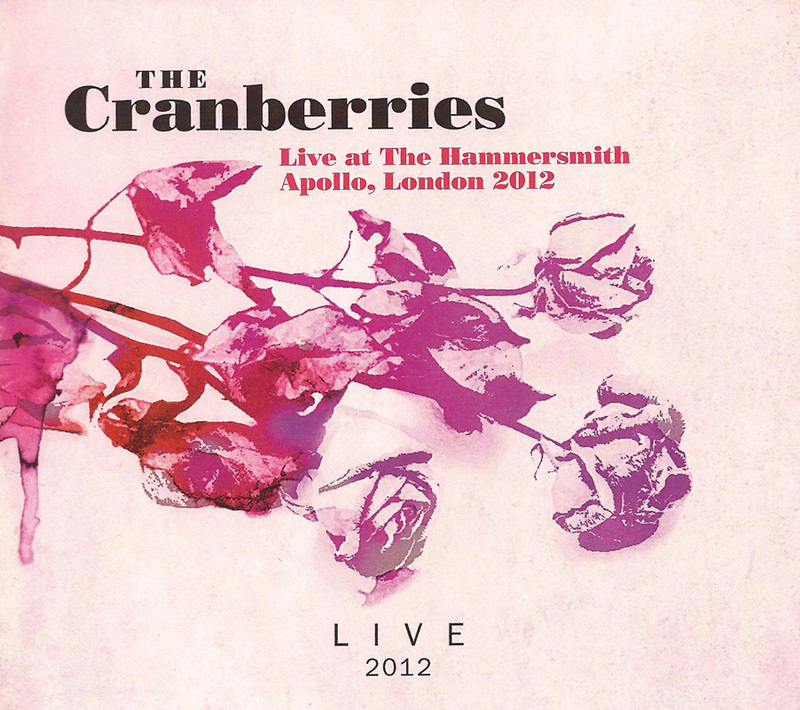 The album sold almost 8 millions copies worldwide, making it the second best selling Cranberries album after “No Need To Argue”. The album was reissued in 2002 with its singles’ b-sides as bonus tracks. Check out our Everybody Else… album page for more details about this record. Time is actually ticking out!! Legendary Windmill Lane Studios in Dublin has issued an appeal to musicians who have worked there to collect their master tapes, among them some of The Cranberries recordings, or else they’ll be destroyed. “We’re appealing to any artists who’ve worked here using two-inch multitrack tapes to come in and reclaim them because we’re in the process of disposing of these tapes” Ian Brady of Pulse told RTÉ Ten. Windmill is now owned by Pulse Recording College. The Cranberries recorded “Everybody Else Is Doing It, So Why Can’t We?“, “To The Faithful Departed“, “Wake Up and Smell The Coffee” and part of “Bury The Hatchet” at Windmill Lane studios. Who said everything? Many of the tapes are either demos, master tape back-ups or discarded takes. Windmill Lane Studios will start to destroy the unclaimed tapes on May 7th. Let’s hope that the band sees this and reclaims their tapes to save them for posterity! Wouldn’t it be nice to have some alternate takes or unreleased tracks just in time to celebrate “Everybody Else Is Doing It, So Why Can’t We?” 20th anniversary this year? The Cranberries will performed their first concert in Mexican soil since 2010 next March! The official Facebook page of the Festival Cultural Zacatecas confirmed the rumor yesterday. The band will be at the Plaza De Armas in Zacatecas, Mexico on Monday, March 25th. This will be a free event. 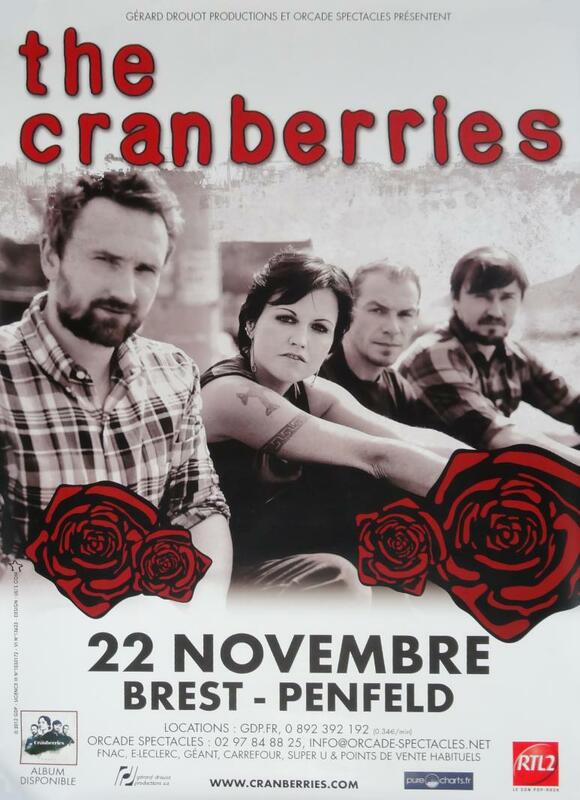 The Cranberries are on break right now since the last show of the European Tour in Montbéliard, France last December. 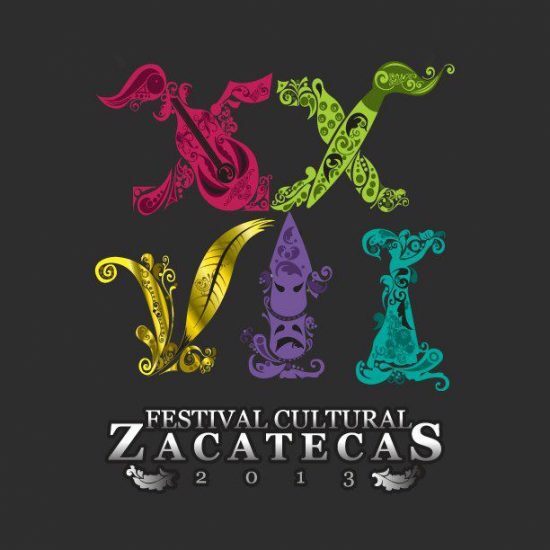 Rumor spread over the internet today that The Cranberries will be part of the Festival Cultural Zacatecas 2013, next March. This year’s program supposedly leaked on social networks today and The Cranberries are said to be part of the March 25th show at Plaza de Armas. The official 2013 Festival line-up should be released tomorrow. Thanks to Cranberries Mexico for the info. 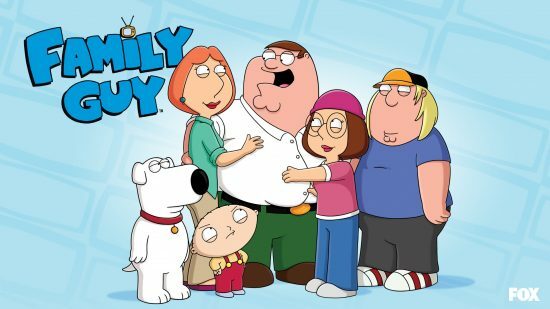 In this quiet period of time in Cranberries-land, here’s a fun tidbit of information: The Cranberries were briefly mentioned on last Sunday’s episode of hit cartoon series “Family Guy”. 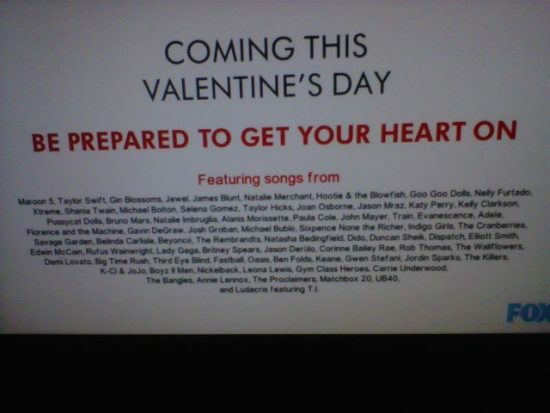 The Cranberries were mentioned among tons of other bands as being part of the soundtrack of a fake Valentine’s Day movie staring the cast of Family Guy. But don’t look forward to hear The Cranberries on any Family Guy soundtrack as this was just a joke, Family-Guy style! Thanks to Richard for this piece of info! 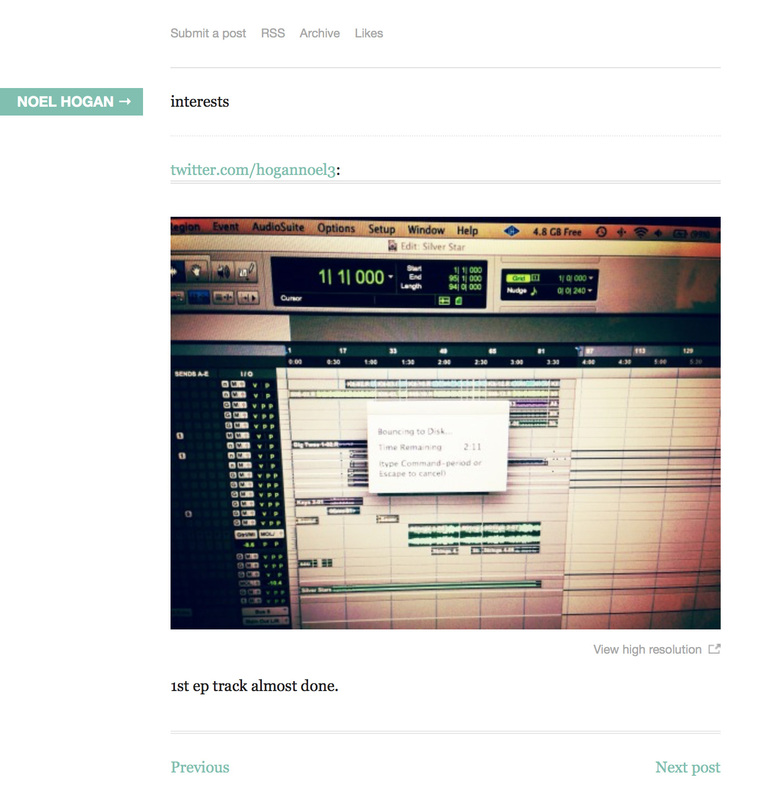 Solo work, collaborations and production by Cranberries guitarist, Noel Hogan. Listen to or buy music by Noel Hogan, including the debut solo project, Mono Band, and Arkitekt, a collaboration with Richard Walters. There is no word about a launch date or if a new side project is on its way. First, we’d like to thank all those who participated, you were more than expected!! The answer to the question was of course “Ode To My Family”, which most of you got right, although many got confused with “Roses”, a song Dolores dedicated to her father. One of you also answered “No Need To Argue”, a 1994 song which is very likely to be written about Dolores’ relationship with first boyfriend Mike Mahoney (although it has never been confirmed by any of the band members). Click here to read the interview excerpt we posted in November in which Dolores explains she can’t sing “Ode To My Family” anymore because the song reminds her too much of her father. Anyway, congratulations to our 10 winners. Note that one of them decided to let someone else have his poster which had us drawing an 11th name by lot. It looks like some of the local labels distributing The Cranberries’ new album didn’t give up on a promotion of “Roses” in some regions. Ten months after the album release, “Fire & Soul” becomes the third promo single in Russia. Two previous promo singles from “Roses” released in Russia (Tomorrow and Show Me) were aimed for the rock radio stations, but never got much attention. Unlike them, “Fire & Soul” is aimed for the radios playing in CHR format (Contemporary Hit Radio) which means that, maybe, the local distributor is trying to showcase a different side of The Cranberries’ talent. “Roses” is distributed by Soyuz Music in Russia. The album peaked at #24 on the Russian charts. “Fire & Soul” joins other songs from “Roses” released as promo singles in different regions. Last spring “Raining In My Heart” was chosen as the second single in Italy and Ireland (and maybe other countries?) and “Waiting In Walthamstow” was released as promo single in the United Kingdom last summer. “Show Me” also got some airplay in the United States, Greece, Poland and Russia. And, of course, “Tomorrow” was the first official single released in many countries all over the world. If you’ve heard The Cranberries’ songs from “Roses” in your country, let us know in the comments! The Cranberries official community is not accessible since yesterday. Technical problem or second shut down in less than a year? Thanks to Javi for the info.